God continues to open doors for the proclamation of the Gospel. This morning it was my privilege to participate in the formal opening of a new mission and preaching station in the community of El Naranjo. The community is about 3 kilometres from Santa Patricia where Pastor Mardo serves one of the first established congregations in the Synod, La Iglesia Luterana Jesucristo Neustro Salvador. 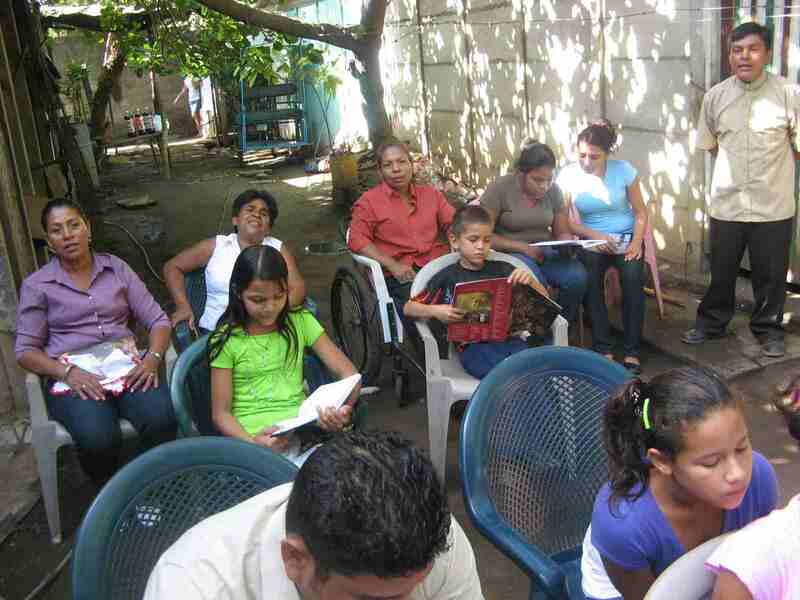 Pastor Mardo began making visits in the community of El Naranjo about one month ago in response to an invitation. A family from the community had been touched by the help received from a visiting Medical Clinic in Santa Patricia and the encouragement and support given by Pastor Mardo and the congregation’s deaconesses. They invited him to visit in their home. The first visit led to a second; then to the start of a bible study in their home and a program of planned visits with all the neighbours in the community. But they weren’t going to wait any longer. Today, they would gather for their first formal service. There were 12 gathered under the Cashew tree. They sang, they confessed; they listen to God’s Word and they prayed that God would bless this new mission start in their community. We join them in praying too that as God opens new doors for witness, we all might be bold to enter and proclaim the name of Jesus. O Lord, grant faith to every hearer! After driving up from Chinandega, about 140 km into the mountains we visited mission work in two towns, Matagalpa and Jinotega. This is a cooler and somewhat wealthier area where coffee cultivation and business is very strong. We met with Missionary Hector and Pastor Immer. Missionary Hector started the mission work in Matagalpa and is now the missionary-at-large of the Iglesia Luterana Sínodo de Nicaragua (ILSN). As he was carrying on the mission, he identified Pastor Immer as a candidate for theological studies. Pastor Immer is from that area and an elementary school teacher in Jinotega. He was ordained as an ILSN pastor in March and serves as part-time pastor of the two congregations, one in Matagalpa the other in Jinotega, about 40 km apart. Each congregation has an average of 30 people in worship on Sundays. The pastors have a strong educational and social ministry focused mostly on children and their families. In Matagalpa they take turns visiting different suburbs on Saturdays for a children’s feeding program. They normally start with an opening service or devotion with children and their parents, later dividing the children into groups by age and involving them in educational and recreational activities. After the meal is served they take time for fellowship and closing of the day’s program. This program has served many children physically and spiritually and has opened opportunities for pastoral contact with the children’s families. This is a beautiful example of mission teamwork and pastors sharing in the work of the Lord’s mission. Missionary Hector, who started the mission, has now transferred the two congregations into the care of Pastor Immer. This frees him to search for other areas to start new mission work. Currently, Missionary Hector is reaching out to a new community, Sebaco in the Matagalpa Department (province). They strongly support each other’s work. There are great needs and challenges in several areas of this mission , but lay leaders, together with the missionary and pastor, are focused, encouraged and determined to share the Gospel the best way they can. These are reasons for our thanks to God. The ILSN convention concluded on a hot early Sunday afternoon. We had a heartwarming communion service involving pastors, deaconnesses, lay delegates, and a number of guests. Newly-elected officers of the church were installed, and people held patience with the preacher (that’s me) while the message got translated into Spanish. How encouraging to hear that several dozen friends in Canada were following this service on the Internet! Monday, January 25, was a lengthy day involving much driving. We went into a mountain region to visit the dual parish in the cities of Matagalpa and Jinotega. At Matagalpa, we met some friends from Christ Lutheran Church in St. Catharines who had been helping with projects there and were preparing to return to Canada. A lengthy conversation with “Pastor Hector,” an evangelistic missionary, began our day. He described the work he had done in Matagalpa, and how this work had now been turned over to a resident “Pastor Immer” after a congregation was founded. It’s much cooler up in the mountains, though plenty warm for visiting Canadians. After Matagalpa, we went up higher to an area where Germans had come in the 1880’s to establish coffee plantations. They still cook like Germans up there, too! Following lunch we travelled on to “Holy Spirit Church” in Jinotega. In each place at least a small delegation of congregational leaders is waiting in the church to greet us and show us their spiritual home. It’s wonderful to realize how all these congregations and preaching stations—24 at last count, I think— have come into existence in the span of very few years. Did I mention how much we owe to Roberto Carlos for his expert driving? Driving looks stressful to me, especially after dark. There is constantly someone walking, bicycling, or riding a horse near the edge of the road. Or unattended cows walking on the pavement on their “commute” back to the barn for the night. Or some guy who drank too freely staggers out onto the highway. Or you run into potholes in the pavement, and some little boy is there with a shovel, filling in the holes with gravel and craving a “tip” for his services. Or there is thick smoke because sugar cane is being burned at the time of harvest. Or … or … or! You get the idea! Under the theme “Unidad e Fraternidad en Cristo Jesus” (Unity and fraternity in Christ Jesus) the last day of the second convention of the Iglesia Luterana Sínodo de Nicaragua started at 9 a.m. with devotion and the business of the day. At 11 a.m. the closing service took place with about 80 people attending. President Bugbee delivered the sermon pointing to the grace of God through Jesus Christ who brought His Church to where it is, and also encouraged the Lutherans in their faithfulness and commitment to the mission of the Lord. The offering from the closing service will be forwarded to those who are suffering in Haiti due to the earthquake. The service also included the celebration of the Lord’s Supper and installation of recently-elected officers. Following the worship, mealtime and fellowship, President Bugbee together with pastors Neitzel and Mayan held meetings with the LCC missionaries to Honduras and Costa Rica who attended the ILSN convention. The missionaries´ reports were very uplifting and encouraging as the Lord continues to open doors for the proclamation of the Gospel. This hasn’t been without difficulties, but the missionaries are encouraged in sharing about their plans to continue taking the Gospel into other communities in these countries. They mentioned specific, small projects that LCC might support in the future. Distances are great. It took pastor Douglas two days by bus to come from his mission area in Honduras to the convention in Chinandega. The missionaries from Costa Rica are not close geographically to the ILSN centre either. Our meeting included a special time in prayer with the missionaries on behalf of their work. They have asked for our continual prayers on behalf of the mission outreach to the communities where they serve. They expressed their gratitude to the Lord and to the churches and individuals in Canada who support the mission. For more information on these missionaries and their work see LCC’s mission pages on LCC’s website. The first day of the ILSN convention, January 23 was very beautiful with all the pastors, deaconesses, teachers and delegates present. Music and celebration filled the Martin Luther Chapel and there was joy in the air. The set up of the ILSN centre and chapel where the convention took place was well organized and the program for the convention uplifting. President Luiz and the missionaries presented their reports; President Bugbee greeted the participants on behalf of Lutheran Church–Canada; the ILSN elected its new vice-president and treasurer today. • challenges and hardships in some areas, but endurance and the joy of the results for God´s glory as people are brought to faith in Jesus Christ as Saviour. While visiting some LCC mission areas in Nicaragua today I witnessed again a visible sign of God´s grace in the life of a small community at Cristo Rey, not far from Chinandega. Deaconess Olivia serves there in the Lutheran children’s education program with Missionary Maximo. Her family had donated a piece of land to build a church there. As we visited the area, we met a group of faithful people from a Lutheran Church–Canada congregation in Thunder Bay, Ontario, putting a cement floor in the church they started to build some years ago. Not far from this area, in another community called Gracias a Dios, a lady and her daughter gather their families and neighbours under the tamarindo (tamarind) trees in front of their houses for people to gather in worship regularly. With my little Spanish I heard the lady mention to Pastor Maximo that there are many more people coming to their services lately from other nearby communities because step-by-step they are receiving the message from a group of people who join in the worship services there. We rejoice, thank and praise our Lord for the beautiful witness of faithful Christians who give their time and resources for the expansion of the Gospel in this area. You are currently browsing the LCC On the Road blog archives for January, 2010.